If you have a life-threatening emergency please call 911 or head to the nearest emergency room. Monday through Friday, we offer urgent care hours so that our the patients do not experience costly emergency room visits, gaps in care or receive fragmented care. 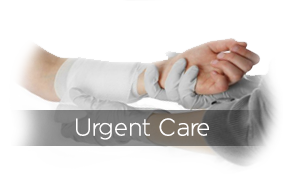 We offer urgent care services which is essentially a walk-in service that we provide during regular business hours. Whether a new or an established patient our clinic maybe used for urgent care services. It is our belief that patients should not have to wait to be seen and therefore should be able to obtain an appointment without prolonged wait. Services include: sprains/strains, suture, abscess I&D, nail procedures and much more. While an appointment is not required, calling ahead will allow us to view and prepare your records and may expedite your visit. On occasion there may be a small wait behind regularly scheduled patients. Each provider works various days and hours, therefore we are not always able to accommodate specific provider requests. In an effort to minimize unnecessary emergency room cost or outside/corporate urgent care visits, our providers make themselves available to assist you after hours. For all routine calls-we ask for consideration and that calls be placed during regular business hours. Unfortunately, we cannot make appointments or fill prescriptions after office hours as our providers do not have access to your records. When the office is closed you may reach a provider by calling the regular office number and following the prompts given. This will allow you to speak directly to the provider on-call for any urgent care needs. If the on-call provider is with another patient, please leave a message and the call will be returned within one hour – in most instances much sooner. If you do not hear from us within one hour, please call back.